The fictitious Acme Corporation makes good use of HourGlass. The application is pre-populated with a full year’s worth of data. You may login as an Acme employee and make time & expense entries, assign & manage tasks, generate & export reports and modify administrative settings. Simply choose the provided login credentials after requesting access and use them to login. You will have access to all of the features and functionality of a regular HourGlass account. 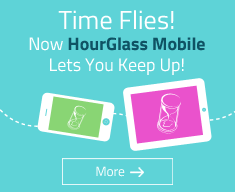 How do I try HourGlass before signing-up? 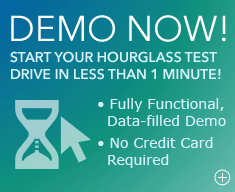 Take advantage of the HourGlass demo. Complete the sign-up form to gain access to 5 different user profiles with unique login credentials and different access privileges. You may choose to login as an administrator, a project manager or a regular employee. The demo is fully-functional and you will be able to test drive the HourGlass application in its entirety before signing-up for your personalized account that is FREE for 30 days. What happens to the data entered in the demo? All user-generated data is reset nightly, so any data you enter will be deleted during the reset. To use and save your own company data securely in HourGlass, sign up now and use HourGlass FREE for 30 days. Why do I see data I didn’t enter in the demo? Other users may be accessing the demo application with the same credentials and at the same time as you, so don’t be alarmed if you notice entries that you did not input. How can I privately use my own company data? You can create your personalized account and use it FREE for 30 Days with no obligation. 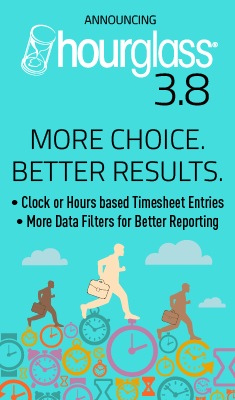 You should allot yourself approximately 20 minutes to enter your company information into the HourGlass set-up Wizard before you can start using the application’s personalized time & expense tracking, project management and reporting features. Only you and the people authorized by you will have access to your personalized account and information within it. Can HourGlass data be exported? Yes, the data can be exported into Microsoft Excel format by generating a report. Can we import our data into HourGlass (i.e. employees and previous time data)? Yes, on an as-quoted basis. Please contact us at sales@hourglass.ca for more information. Can HourGlass be integrated with other systems? Yes, by exporting your data into Microsoft Excel format, then importing it to the other system. Can HourGlass be installed on our local server? Can HourGlass be installed on my desktop? You can upgrade your monthly license(s) to annual and save 33% off the monthly price at anytime. Remember, there are no sign-up fees, no setup fees, no termination fees, no hidden costs and you can cancel at any time. Additional information can be found on our pricing page. Your bill is based on the quantity of licenses and the payment plan type selected in that subscription. The Renewal Date is the date the payment will be processed. An organization may have more than one subscription and potentially more than one renewal date. Is there a free period for a personalized account? Yes. Complete the sign-up form to create an account. We will email you instructions to activate your account. Once your account set-up is complete, you will be able to use HourGlass FREE for 30 days. What happens at the end of the FREE 30-day period? We will notify you several times before the Free 30 day period expires. If you want to keep using HourGlass, you don’t need to do anything and you will start to be billed. If you want to cancel your subscriptions, do so before the end of the Free 30 day period and you will not be billed. Why do "cookies" need to be enabled? Who sets up the information (e.g. employees, clients, projects, rates etc.)? Person(s) designated as your company's HourGlass Administrator(s). How secure is HourGlass and my data? SSL is an acronym for Secure Sockets Layer, a secure protocol developed by Netscape to transmit data over the Internet. HourGlass uses it to protect the data your organization submits.